I have always wanted to hear seals sing. There are many stories and legends out of Scotland indicating that seals are great lovers of music and great singers as well. There is nothing in the scientific literature about this at all. Not a word as far as I can tell. I have called to seals with my penny whistle and had them appear out of nowhere to listen. My partner, Cynthia, once heard a harbor seal sing a single, pure note as it surfaced next to her kayak. In our musical duo, Coracle, we play several tunes that are thought to have come from the singing of the seals. But until this past summer, I had never heard the seals sing. Cynthia and I are planning a concert that will take place on February 21st in Bellows Falls, called The Seal Woman’s Sea Joy. The concert will feature our seal music, and other music inspired by the sea and our deep connection to the creatures of the sea. In fact, we were writing the description for the concert just days before we heard the seals sing. I have talked to a few people now who have heard the seals sing, so it is not quite as uncommon as I had thought, but still I can not find any mention of it in any scientific journal or book. We were camping on the coast, in a location that for various reasons I shouldn’t disclose, when we were awakened just before sunrise by one of the strangest sounds I have ever heard. We were deeply puzzled by it, and lying in the tent we tried to figure out what it was. A radio in the distance? A dog barking? Someone singing? Some strange sea bird unfamiliar to us? The wind? It hit us nearly simultaneously, I think. Seals. We were hearing the singing of the seals. We scrambled out of the tent, grabbed binoculars and microphones and ran out to the point of land. And there, on a rock exposed by the low tide, were a couple of dozen seals. Far enough away that we could not see them very clearly, and are still not sure whether they were harbor seals or grey seals. Either is possible. Or both. They sang for about an hour, while the sun rose. My recordings are marginal, thanks to gulls, wind noise, the crashing of waves, and the slapping of mosquitoes. But we will be using the best parts in our program on the 21st. But, more important, now I know it is true. Seals really do sing. I don’t know if they are actually singing songs. That would require a repeated pattern to the vocalization, and I have not found any repetitions in my small sample of recordings. But they are melodic. They are lovely. Well, not to everyone. 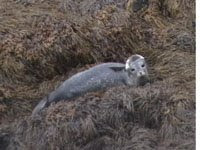 A fisherman was out there collecting seaweed from the exposed rocks, and the recording clearly catches his commentary on the singing seals, “They sure do like to holler, don’t they?” About an hour later that same fisherman was out there in his boat shooting those very same seals. Not for food or clothing. Just for spite. A common practice, we were later told. It was an incomprehensible whiplash of shock to be delightedly listening to the seals sing one moment, and helplessly watching them being slaughtered the next. We couldn’t make sense out of it then, nor now. Their singing was a profound gift to us, and it surely drew attention to them, bringing death to we do not know how many. In the old legends, killing the seals was also common practice. But invariably those who hurt the seals hurt them selves in some way. The seals saw to that. On the other hand, those who helped the seals, or just loved them, were always rewarded in some way, with abiding friendship if nothing else. We wonder what harm this fisherman has brought upon himself by slaughtering these innocent singers. The fishing way of life is dying, and the fishermen take it out on the seals. We wonder what benefit he and his fellow islanders might reap if they can learn to love what they now hate. And I wonder if the seals are really singing. It is impossible to calculate the good that was done for whales when Roger Payne and Scott McVay discovered that humpback whales sing, and spread their songs throughout the human world. If seals are singers too, it might awaken us once again to the intelligence and beauty and social sophistication that shares the planet with us. Once upon a time I was fascinated with SETI, the Search for Extra Terrestrial Intelligence. Well, we don’t even recognize intelligence when it is in our own back yard. Often enough we kill it. What makes us think we would recognize it, and honor it, if it came from outer space? I am told that along the Maine coast, shooting seals is a thing of the past, maybe two generations gone. And I understand that seals are generally flourishing, the elimination of cod having opened up food sources for them in many areas. The human battle against the seals is one the humans are sure to lose, one way or the other. Either we will fail to exterminate them, or we will succeed in that, and lose the opportunity to learn from them, to appreciate them, to fall in love with them, and with the other life forms that share this magical, singing world.